Long gone are the days of the Ford Galaxy 500, the Fairlane and the LTD. Under its new CEO, Ford Motor Co. (F - Get Report) may be on the path to becoming a completely different kind of automaker, with the latest signal coming Wednesday, April 25: the company will cut its car lineup over the next few years to include nothing more than the Mustang and a new Focus Active crossover. "Given declining consumer demand and product profitability, the company will not invest in next generations of traditional Ford sedans for North America," Ford said in its Wednesday earnings release. "Over the next few years, the Ford car portfolio in North America will transition to two vehicles - the best-selling Mustang and the all-new Focus Active crossover coming out next year." The company said it is also exploring new "white space" vehicle silhouettes that would combine the best attributes of cars and utilities, such as higher ride height, space and versatility. Ford shifting its focus away from U.S. car sales is not all that surprising, though. The company has signaled an intention to do so in recent months, and as TheStreet previously reported, Ford made up just 9.1% of the U.S. passenger car market in 2017 with 555,838 vehicles sold. That compares poorly to market leader Toyota Motor Corp.'s (TM - Get Report) 14.8% share, representing 905,925 vehicles, and runner up Honda Motor Co.'s (HMC - Get Report) 12.3% share, or 752,558 vehicles. Also ahead of Ford in total car sales are Nissan Motor Co. (NSANY and General Motors Co.'s (GM - Get Report) Chevrolet brand. Ford's most popular passenger car, excluding the Mustang, is the Focus, which made up just 2.6% of the car sales market, compared to the Honda Civic at 6.1% and the Toyota Corolla at 5.3%. Still, the move is a gamble, according to some company followers. "Ford realized it can't be everything to everyone, and in today's market that could be okay," Jessica Caldwell of car research firm Edmunds said in an emailed statement. "The key to success is focusing on where your customers are and where your strengths lie, and for Ford doubling down on trucks and SUVs could be just what the brand needs. "But this move isn't without risk: Ford is willingly alienating its car owners and conceding market share in segments that, while declining, are still relevant to some buyers." The news of Ford's partial exit from North American cars came as the automaker reported it earned 43 cents a share, or $1.7 billion, in the first quarter, beating analysts expectations by 2 cents. The company also crushed on the top line with $42 billion in revenue. Analysts surveyed by FactSet expected Ford to report earnings of 41 cents a share, or about $1.6 billion, on almost $36.8 billion in revenue for the quarter. The Wednesday report puts Detroit-based Ford well on its way of hitting the targets set by company followers for the year. Analysts surveyed by FactSet expect Ford to earn $1.56 a share, or more than $6 billion, on $146.3 billion in revenue in 2018. Ford's stock was up almost 3% shortly after the opening bell Thursday. Ahead of the report, analysts attempted to dilute the effect of Ford's sales struggles in the first quarter. The automaker on Tuesday revealed that its sales declined by 3% during the period, even as the auto industry on a whole saw sales growth. Edmunds earlier this week noted that Ford's passenger car sales continued to struggle, and SUV sales even saw a slight dip. But Ford's light trucks remained a strong cornerstone of the company's market, making up 78.5% of its sales. "Ford's decline in sales isn't necessarily a bad sign for the company; these numbers are par for the course in a market where consumers are flocking toward trucks and SUVs," Caldwell said Tuesday. "What we really should turn our eyes toward is the F-150, which continues on a fiery sales streak that bolsters the company's bottom line. While incentives were up by nearly 6%, Ford's reduction in days-to-turn is a strong indicator that these dollars are being spent wisely." In its Wednesday release, Ford said "its fitness initiatives are driving an improved outlook." The company added that its first quarter numbers are in line with expectations and put it on track for the year, but it "can, and must, do better." Ford, whose CEO Jim Hackett has been in the role for less than a year after a career mainly outside the auto industry, has been undergoing a transformation over the past year and preempted its Wednesday earnings with another Tuesday release outlining its revised vision for China, the world's largest auto market. The automaker said it had created a single new distribution channel for its greater China business to accelerate growth, and the company added a number of folks to its leadership teams in China, the Middle East and Africa. The move comes two months after Ford's president of North America, Raj Nair, was revealed to be leaving the company. At the time, Edmunds' Caldwell said another change in senior leadership is "the last thing Ford needs" right now. "It's been a revolving door at the top of Ford for the last year, and with declining U.S. sales and pressure to show progress on its mobility strategy, the company really needs consistent, focused leadership in order to deliver the results Wall Street is demanding." 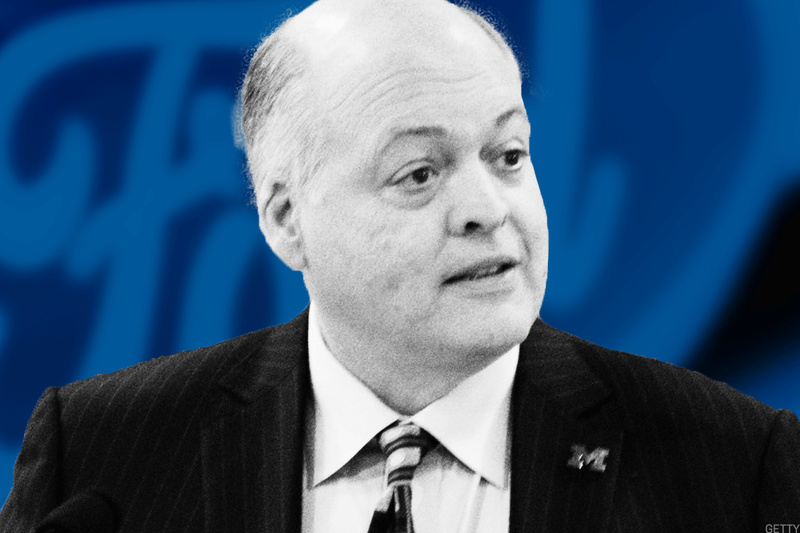 But Hackett said Wednesday his team is now "committed to taking the appropriate actions to drive profitable growth and maximize the returns" of Ford over the long term. "Where we can raise the returns of underperforming parts of our business by making them more fit, we will. If appropriate returns are not on the horizon, we will shift that capital to where we can play and win."